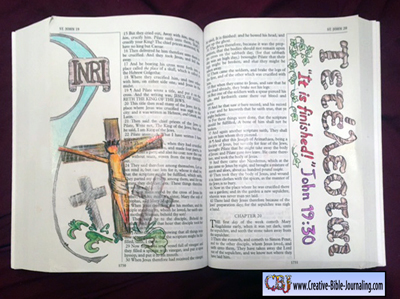 Follow Jackie Mattingly’s step-by-step directions to make this unique stamped Bible Journaled Page. Can be duplicated in Matthew, Mark, Luke and John. This stamping project works equally well as a tip in or full page artwork over type. 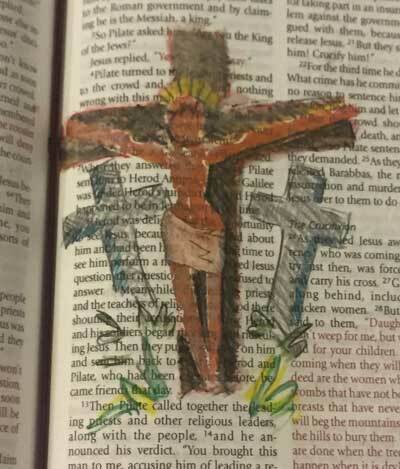 You can leave your art simple with just the crosses and Jesus. 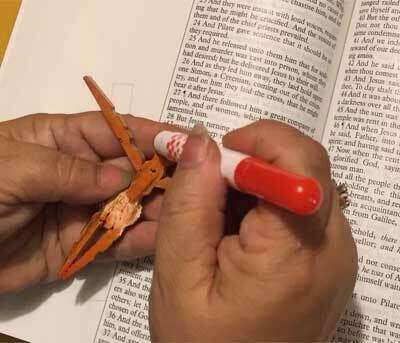 Or you can embellish the art using inspirations from the verses. 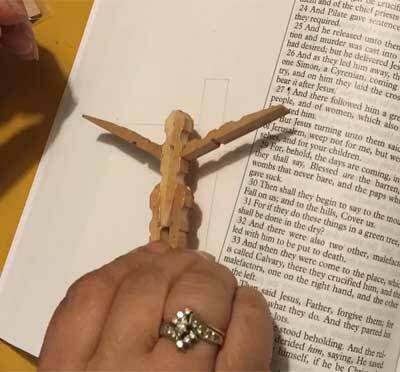 If you have not made a clothes pin crucifix that you can trace around for a stencil of the cross use a pair of the clothes pin pieces to trace around. 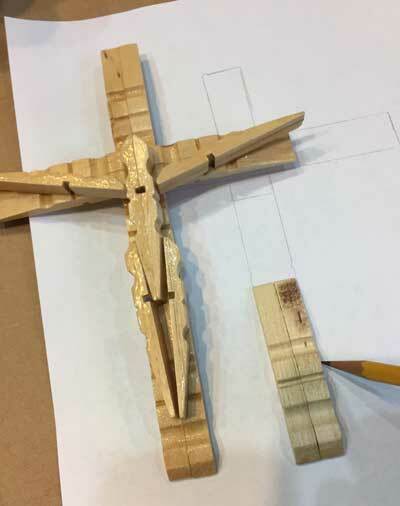 Use wood glue or hot glue to assemble the body of Jesus. 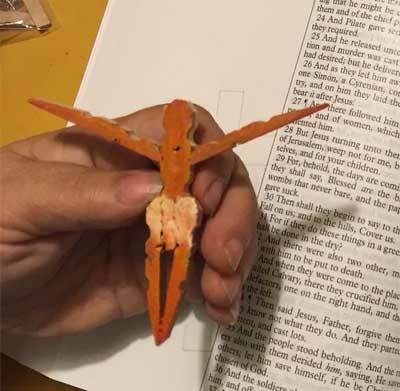 Make sure his hands do not rise above his head. 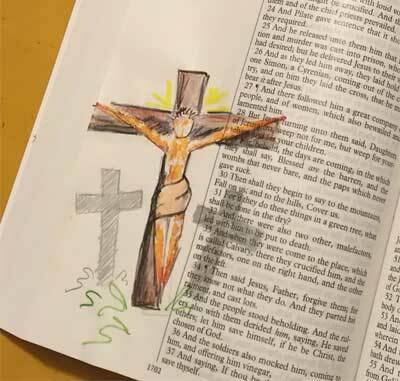 I recommend that you do several Crucifix illustrations on plain paper first, before you do it in your Bible, just to get the hang of the abstractness of this project. 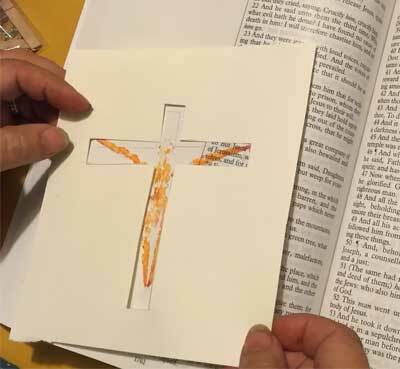 If you really like your sample art you can place it as a tip-in at one of the other verses in Mathew, Mark, Luke or John. 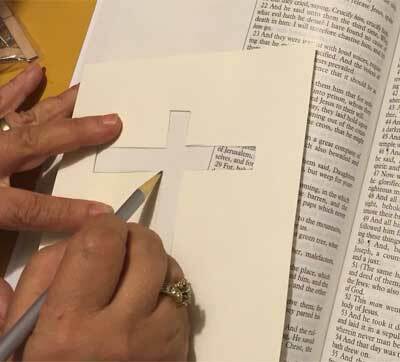 After you have made a stencil from the cross you can slide it around on the page and determine exactly where you want your largest cross to be. 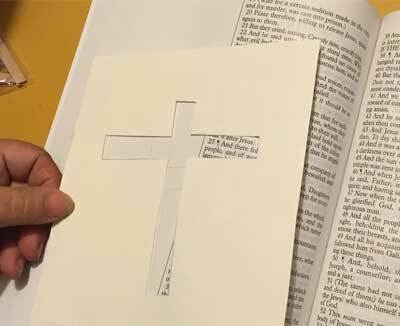 Take into account the two smaller crosses, one to each side of the larger cross, that will be added later. 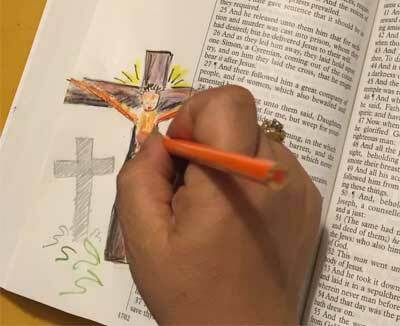 Lightly sketch the outline of your cross. 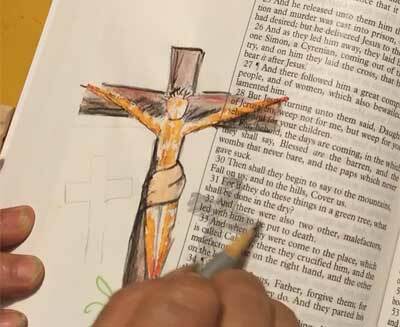 After determining the placement of the sun to get your light direction, cover the entire body of Jesus in a medium color, put a darker color on the shade side of Jesus (Brown or Purple both work well for shading) and a lighter color on the highlight side. Throw in a tiny bit of abstract colors in the shadows and highlights. My preferred gel crayons came from Target, but they don’t carry them anymore. Crayola Twistable Slick Stixs works well and so do Gelatos, but I don’t care for the metallic or glitter Gelatos, for this project. We are going to put a “loin cloth” on our little Jesus. So you don’t want to put “a lot” of color around his hips. For the loin cloth, if you don’t have white, just don’t put any color in that area except for shading. 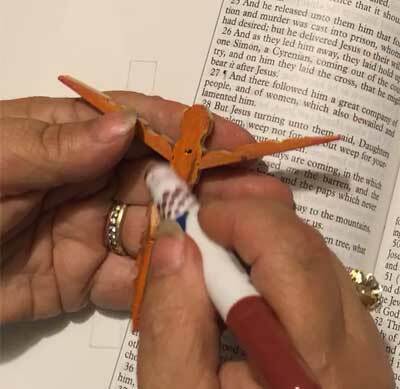 You will want to put just A LITTLE red across Jesus’s forhead, where the crown of thorns will be. Don’t use to much, you can always add more later if you want. 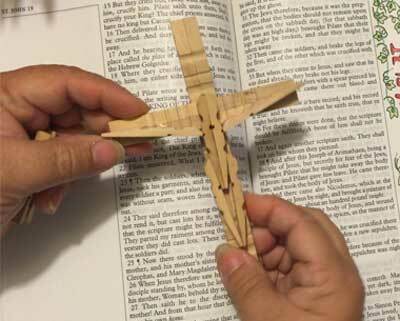 Place Jesus’s body on the cross, making sure his hands and feet are over the wood of the cross. 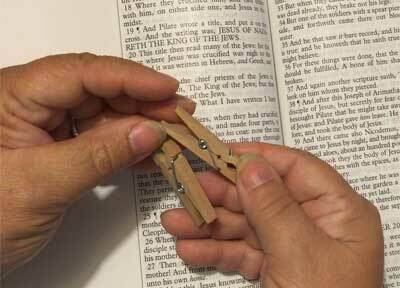 Without moving, which would cause a smear, press firmly on Jesus’s head, body, legs and both arms. 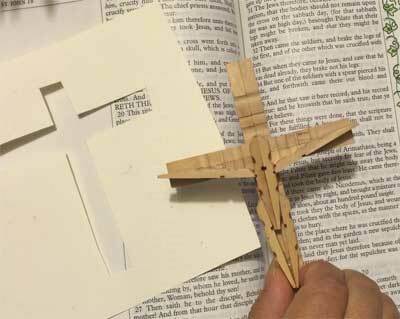 Position stencil of cross, matching original sketch lines. Dab brown, plus a dark and light color on a “foam stomper”. I used brown and purple and yellow. Stomp color through the stencil anywhere that should be wood. The colors can be very abstract since we are going to use colored pencils for the detail. 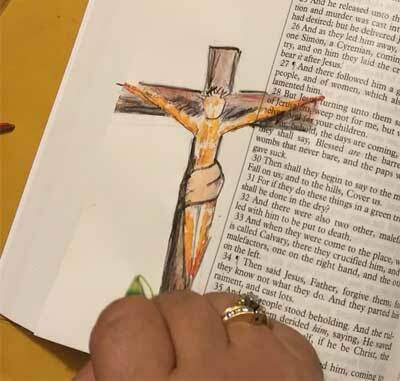 Once the product you have used to color the body of Jesus and the Cross have dried thoroughly, you will begin adding detail and shadows to the outlines of the cross, Jesus’s body, and the crown of thorns. 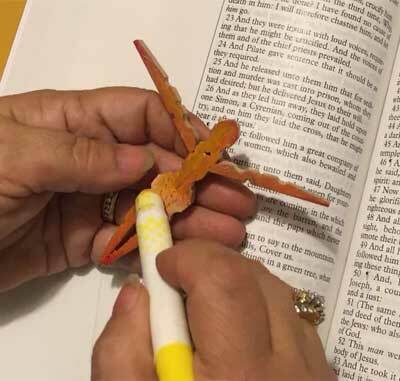 Remember to not add TOO MANY details. Less is definitely more. 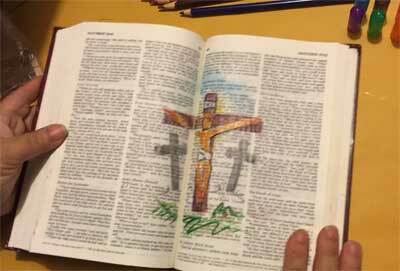 Remember where you want the sun, begin by shading the far side of the body and cross. As silly as it sounds, it may help to place a yellow post-it note where you want the sun, to keep focused on where the shadows should be. Start with your colors light and build layers of shadows. 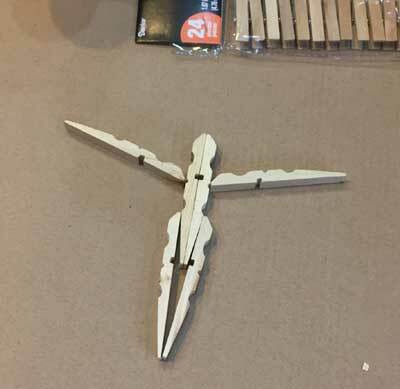 I used a single clothes pin to outline the lesser crosses. 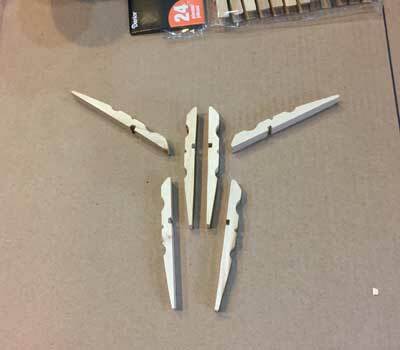 The full pin for the vertical portion and a little more than half the length of the clothes pin for the horizontal bar. 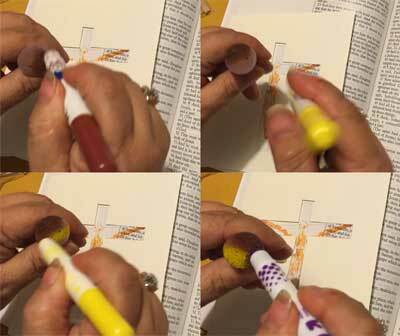 The two lesser crosses are only “in shadow” and have very little detail. Add bits of abstract colors and details. 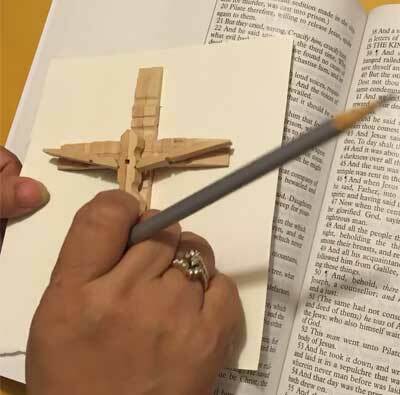 Make sure you have shadows under the chin and on the wood of the cross from where there should be shadows from the body and on the lower sides of the body.